One of the first things you will notice about Ingrid is its design. We named this design the Obsidian UI. We had a few important criteria when we set out to design the interface. The most important criteria was to make it elegant. We wanted a very elegant design that would immediately make an impression on the user. We also wanted it to be absolutely user-friendly, clean and responsive. From the very beginning the decision was to use a dark background and there's a very important reason for this. Most websites and applications mimic what we are accustomed to seeing and using in our daily lives in terms of using a white or really light colored surface to display text. This is because we're used to working on paper. We are, however, of the opinion that this is not best way to display text. In nature, white paper reflects light which can be a bit harsh on human eye but it's even worse on computer screens because they actually emit light. Though this is a bit of an exaggeration, this is somewhat like someone is holding a flashlight directly into your eyes. Because we expect users to stay on Ingrid for extended periods of time, we wanted to make sure that their experience would be as comfortable as possible. This is the reason why from the beginning the idea was to use a dark background. Along the way, we came up with this current design. When our designer presented this design to me, the first thing I could think of was "obsidian" which, according to Wikipedia, is a naturally occurring volcanic glass formed as an extrusive igneous rock. 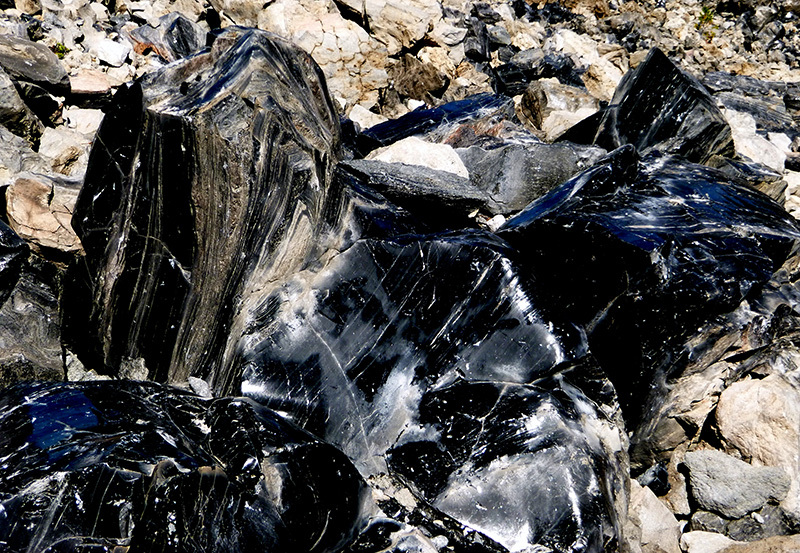 What's really very nice about obsidian is that it doesn't have a single uniform color or pattern to it. Rather, its color can range from dark black to green, blue, red or even bright yellow. Being located in Jackson Hole, Wyoming -- only about 50 miles south of Yellowstone National Park -- might have influenced my coming up with that name. Those who visit the Yellowstone National Park could vouch for the incredible colors and patterns one can witness in nature, especially if the area is sitting on top of a supervolcano. I'm keenly aware that we're currently in beta phase and pretty certain that we will discover issues with our user interface. Nevertheless, we will fix those bugs and further improve Obsidian UI to make it the most elegant and user-friendly interface you've ever encountered! We've named Ingrid's cool user interface the "Obsidian UI" because of its similarities to the volcanic glass it's named after. Being located in Jackson Hole, WY may have influenced us a bit!